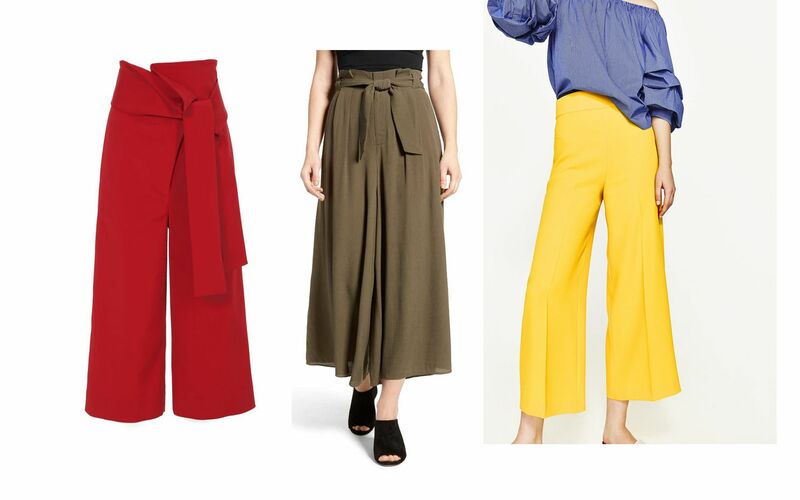 Go on and give your wardrobe that much needed update with culottes! They are super comfy -- perfect for scorching hot weather because they’re breezy, chic, and look better without a lot of layers. But, what exactly are culotte pants? They are like cut off trousers: wide legged pants that usually sit high on the waist and can have a tie around the waist too. Modern culotte pants are loose and flowy, with lengths that vary from typically below the knee, to above the ankles. Playing with different lengths can be tricky though, so knowing your proportions is key. Give your culottes a trendy summer vibe by pairing it with a cropped top, a simple tank, or if you dare – a bralette. Put on a blazer or tweed jacket to give it that polished look appropriate for the office. For tips on what shoes to wear, the same rules apply. Pop on some heels for a dressier look and flats and/or sneaks if you want to be casual -- they are all suitable for a pair of culottes. This article is part of a series called Phililippine Tatler Style Picks, written by our Fashion Editor, Monique Madsen. With this we bring you the latest tips and advice on fashion and style.